Week 7 of Wardrobe Architect focuses on prints. You can probably guess that of all prints, plaid is my favorite. 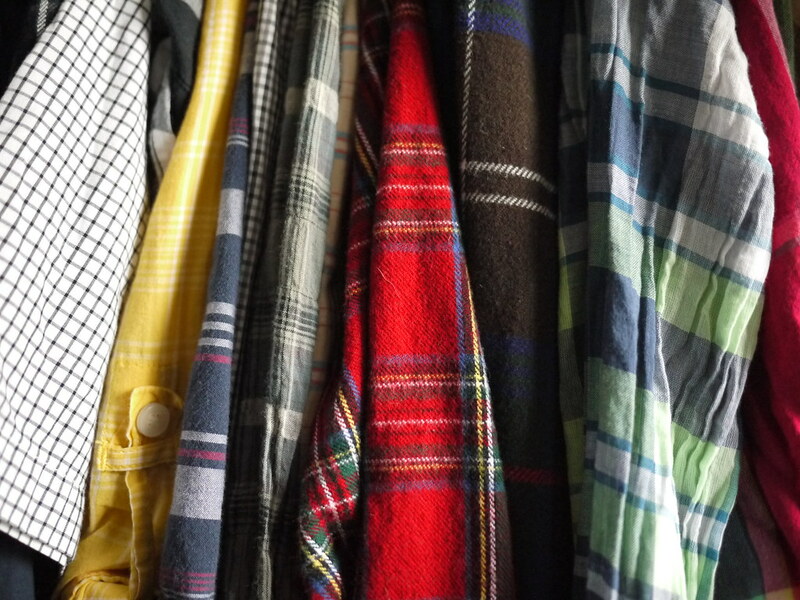 Most of the shirts and a couple of skirts and dresses in my closet are plaid. In the past I’ve even had plaid shoes. Why such a love affair? I’m not sure. Perhaps it’s a holdover from my mid-nineties grunge days, or summers of Girl Scout camp. I like plaids because they tend to combine the colors that comprise the foundation of my wardrobe (like greys and navies), with colors that I like to wear but not go overboard on (like mint and red). The neutrals tempers the bolder colors and provide a lot of visual interest with the pattern. I also like how versatile plaids can be, rich, cozy, and wooly for winter, as well as light and breezy for spring and summer. I just can’t get enough plaid, period. When it comes to prints that I wear, I go for the geometric and stay away from abstracts, florals, and whimsy. Interspersed with the plaid shirts you’ll find some polka dots, pinstripes, and a some herringbone tweed. If you open my t-shirt drawer it’s stripes on stripes. But then you go check out my craft closet and realize that what I’m wearing, isn’t necessarily what I’m buying. I have quite a few prints lingering in there that I bought with the intention of making shirts or skirts out of, only to get them home and realize they’re mostly a little too whimsical for me. I’m definitely going to be more mindful with my fabric purchases this year, just like I have become with my yarn stash. For a while I kept buying pink yarn, even though I hardly ever wear pink (it’s not really my color). I’ve updated my Wardrobe Architect board over on Pinterest with some of my favorite prints. In the process I fell down the rabbit hole over on Spoonflower. So many great stripes! I’m really inspired to start making my wardrobe as I get my body back into shape. How do you feel about prints? Are you plaid and stripe crazy like me, or maybe a little more floral and fanciful? This entry was posted in fashion, plaid and tagged colette patterns, coletterie, fashion, herringbone, personal style, plaid, stripes, wardrobe architect. Bookmark the permalink.